The Heddon Torpedo create a wild splashing surface disturbance which make them perfect for schooling fish. To perform at their best you want to use quick, short and erratic twitches! 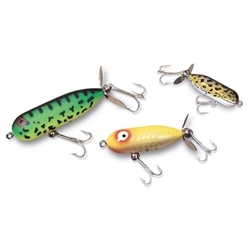 The Heddon Torpedo has been the world's top-selling lure that will cast a little farther than many other prop-baits. The Torpedo comes in three castable sizes: Baby 2-1/2" 3/8oz, Tiny 1-7/8" 1/4oz, and Teeny 1-1/2" 1/8oz.